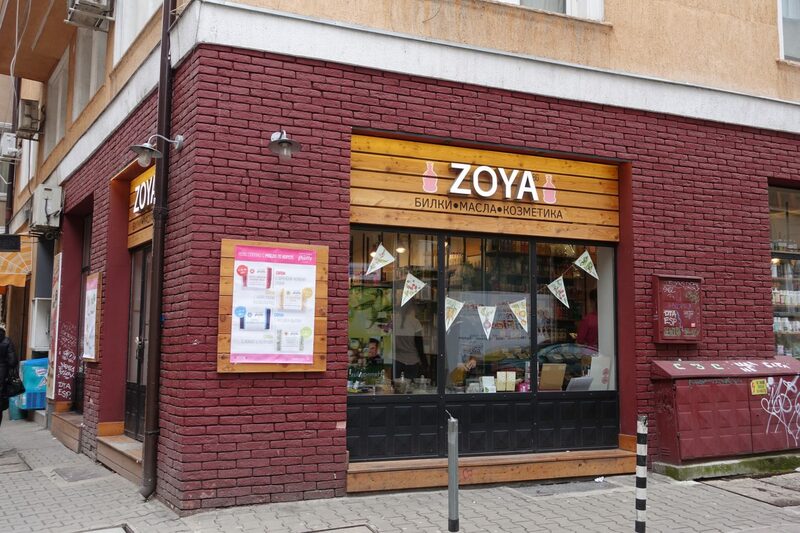 My partner was on the hunt for shea butter and a quick google search led him to discover Zoya, an organic & natural store in the heart of Sofia, Bulgaria. We were on our way to Sofia and this store was one of the first things we just had to check out. 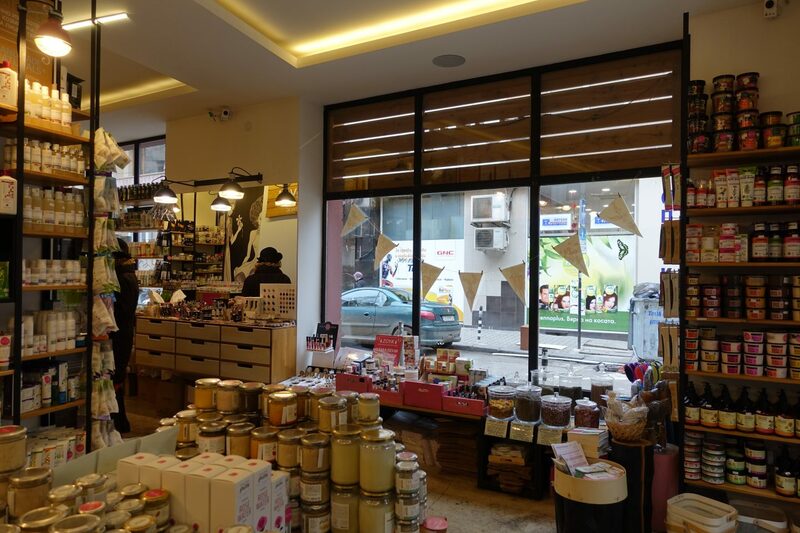 This post focuses on the latter, the Zoya cosmetic shop. Zoya located at 12 Dobrudzha St. 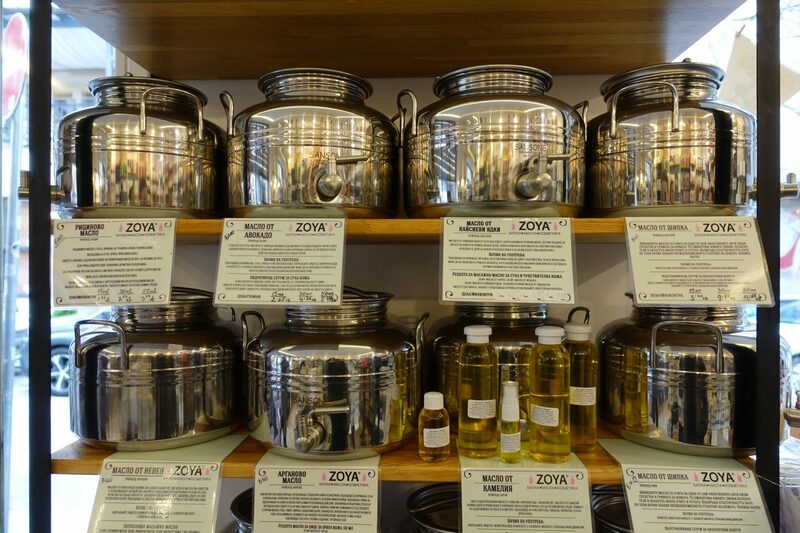 If you care about reducing your waste and favor natural products over products laden with toxic chemicals, then Zoya is your place. 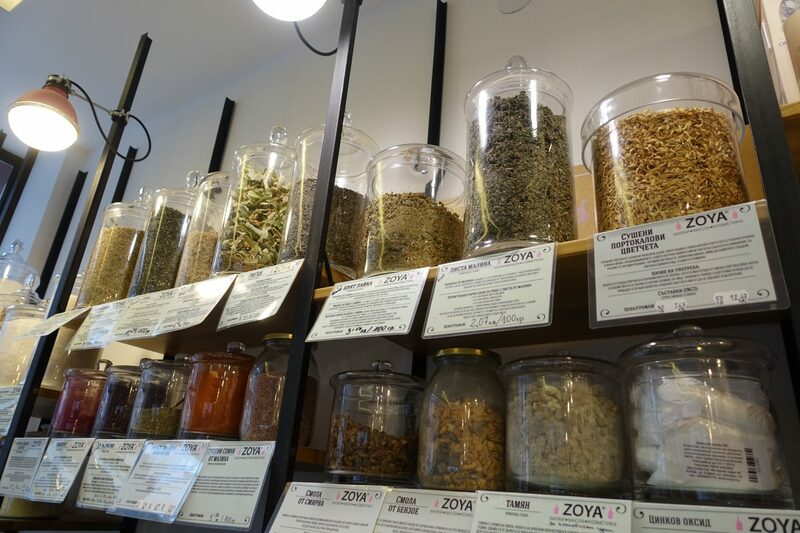 Zoya is an organic & natural skincare store that stocks products for your hair, face, home and body. They stock local as well as international brands and also have a great variety of products from their own natural and simple skincare range, “Zoya Goes Pretty”. They have oils, body butter, herbs, clays, scrubs, dishwasher liquid, laundry detergent and heaps more, both in bulk as well as packaged. 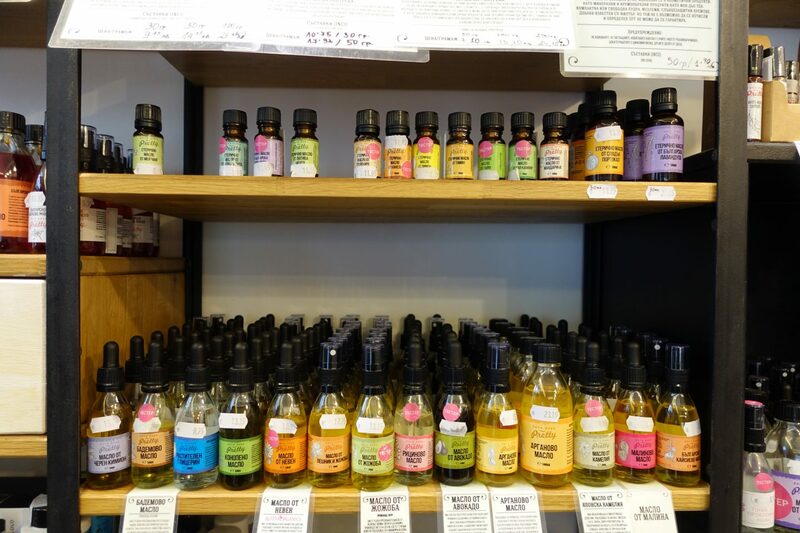 Their selection of oils in bulk is huge! My partner was interested in getting an oil blend to be used as a facial moisturizer. The lovely staff member assisting him was very knowledgeable about the oils on display and upon her recommendation, my partner ended up getting an oil blend – he got avocado oil mixed with grapeseed oil, argan oil and a drop of orange essential oil. 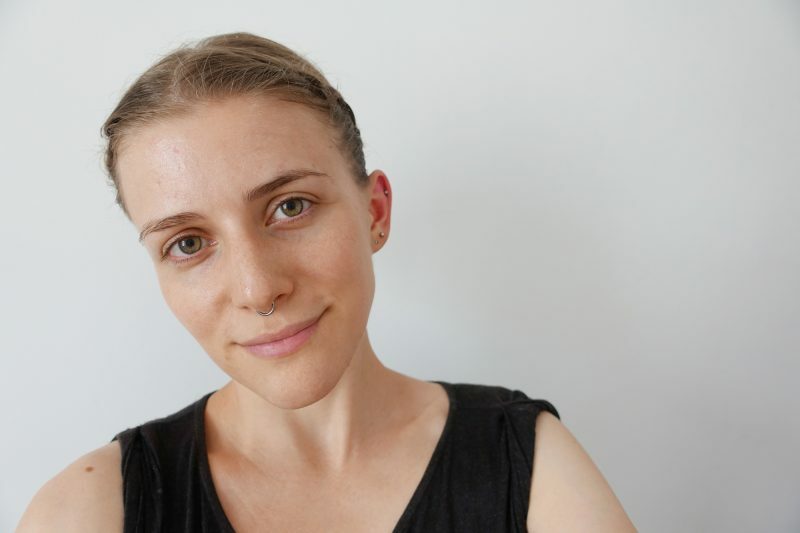 I make my own soaps and focus on herbal shampoo bars and whenever I travel I make it a point to seek out local soaps. I find smelling them, looking at them and checking their ingredients super interesting. 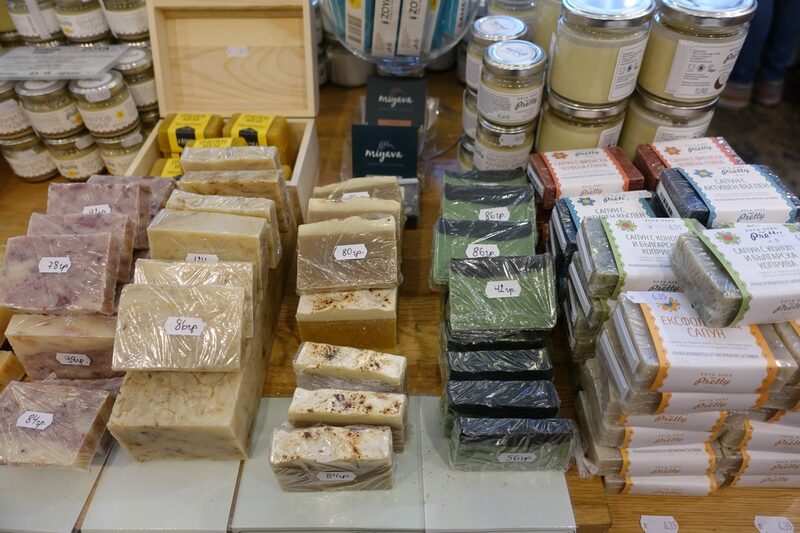 Zoya has a huge selection of homemade soaps and my photo only shows about 1/4 of what they have. Yesss, their selection is that big! They basic olive soaps, African black soap, soaps with clay and soaps with all sorts of essential oils. If you are a lover of soap then stopping by Zoya is a MUST! 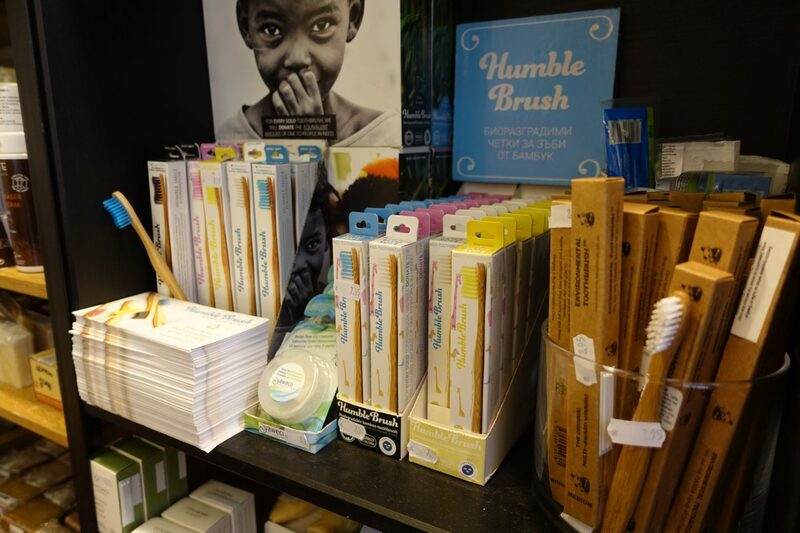 They also have a great selection of bamboo toothbrushes and natural toothpaste. 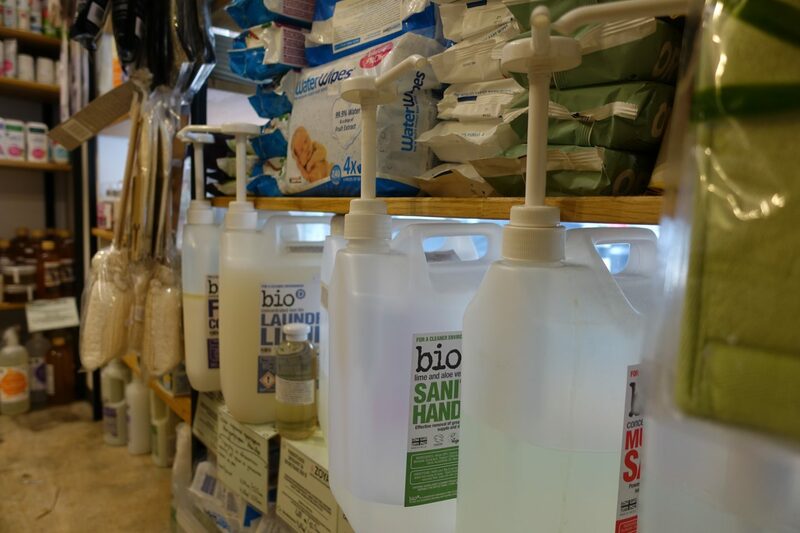 As mentioned earlier, apart from products for the face and body they also have a decent sized section of products for the home – sponges, wipes, detergents and the like. They have laundry detergent, hand sanitizer, dishwasher liquid and heaps more in these big pump containers. What surprised me the most was their huge selection of henna hair colors. They even stock Indian herbal powders (aritha, shikakai, neem, etc.) of which I am a huge fan because I used them religiously in my shampoo bars with great results! I absolutely love this store and what they stand for. I sampled a whole bunch of their products (they have testers for everything!) and loved it all. 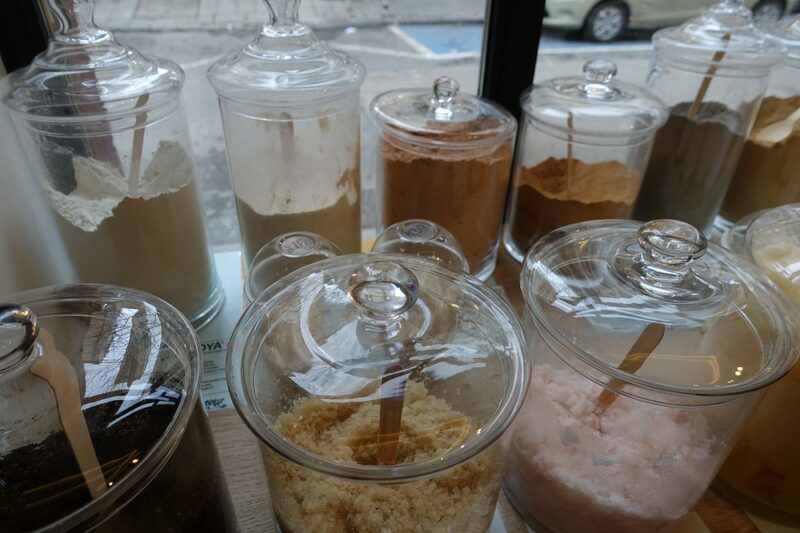 If you are a lover of buying skin care products in bulk, if you enjoy making your own skincare products and if you happen to favor natural & organic products over products laden with toxic chemicals then Zoya is your place. Check out their online store and Instagram account. I found the staff members working at Zoya incredibly knowledgeable, so make sure to ask them any questions you may have. I am sure they’ll be able to advise you on what works best for your skin type! 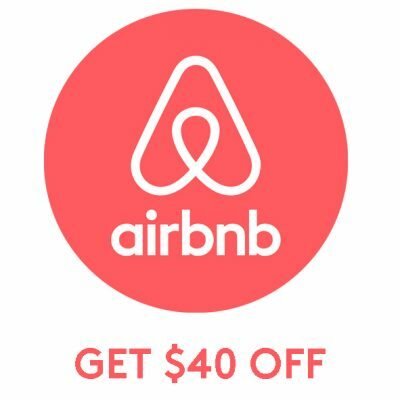 Wow, this place looks amazing! 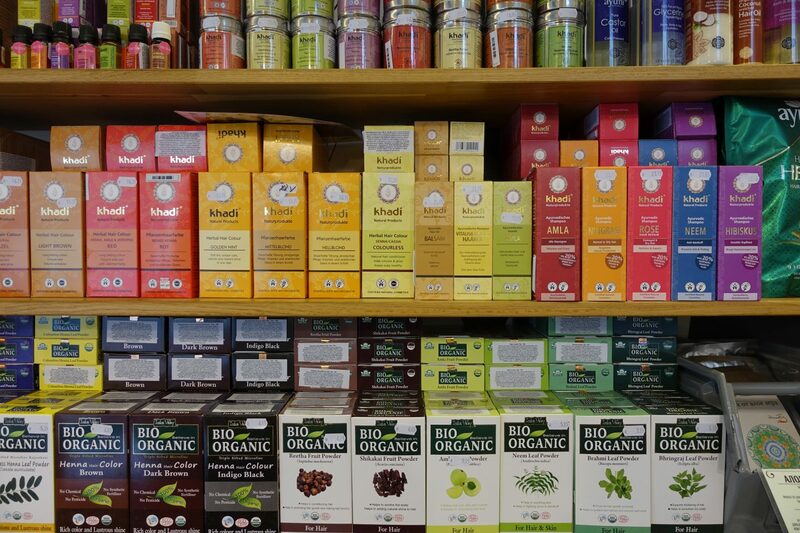 Such a huge selection of natural, eco-friendly products and so many bulk products too! You are my inhalation, I own few blogs and occasionally run out from brand :). “Truth springs from argument amongst friends.” by David Hume. Hi, I’m Nina! Welcome to The Minimalist Ninja, a YouTube channel, and blog about minimalism, being vegan, green travel, moving abroad, and frugal living.